It's been a while since we had any reviews here and I have to admit the fault is all mine! I have just been too busy with other personal things and as such barely had the time to look up new campaigns etc. However, things are easing up a bit and I do look forward to sharing my ideas and honest opinions on a broad spectrum of EVERYTHING, so watch this space! Coming from me this might sound like a surprise but I have got to say there are some gadgets I have had to constantly question my need for but others I knew from the get go would be an absolute value and one of such is the HP Envy 4527 All-in-one printer. 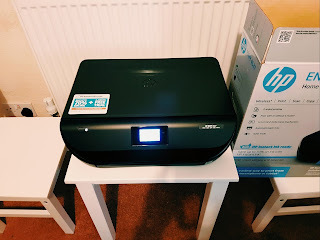 Just like the name implies, it a printer for all times and seasons and by that I mean this printer is not just limited to printing,copying or scanning documents but it easily prints pictures too. It is a wireless and easy to use touch screen printer,capable of easily connecting to WiFi and affords you the opportunity to easily print high quality photos directly from your smart phones or tablets. TO start with I have to say this is one of the easiest gadgets I have had to set up,I did not have to refer to the manual for once. Once plugged, it was simply ''touch and go'', via the on screen display feature it provided set up instructions including a step by step guide on how to load the ink cartridges . The printer is quite aesthetic and makes a nice and decent addition to my home. Its such a versatile little gadget that didn't let me down when I put it to varied work and leisure tasks i.e printed,scanned some documents and also printed some coloured pictures. I particularly love the fact that the printer is so compact and takes up very minimal space. If I had to compare it to my previous printer in terms of design, functionality and feature , I would give the HP ENVY 4527 All-in-one printer consistently top marks,it definitely ticks most boxes for me. I also love the fact that it is surprising quiet, I mean with my previous printer, it almost seemed like there was the 'hesitation' of whether to print or not with the constant clicking sound! Its not so with the HP Envy 4527 printer, it prints at the flick of a button, it just prints...no hesitant clicking sounds! Apart from the fact that that it is a wireless printer, when it came to printing pictures from my phone, I realised I didn't necessarily have to connect to my wifi or any networks to do so. Once linked to phone I simply followed the on screen instructions and in no time the printer was churning out my pictures...just like that high res photos printed right in the comfort of my home . I have to also say that the quality of my pictures were just as great as those of the ones I had printed from the photolab in the past. I also had some random documents printed off my email as well with no hassles at all either. There are still some other features I am yet to try and this includes printing black and white pictures, which the printer is very well capable of doing, automatic two sided printing which I absolutely cannot wait to try and of course the remote printing. I really look forward to being able to send stuff straight to the printer from anywhere, whilst on the go via the printer remote mobile app. 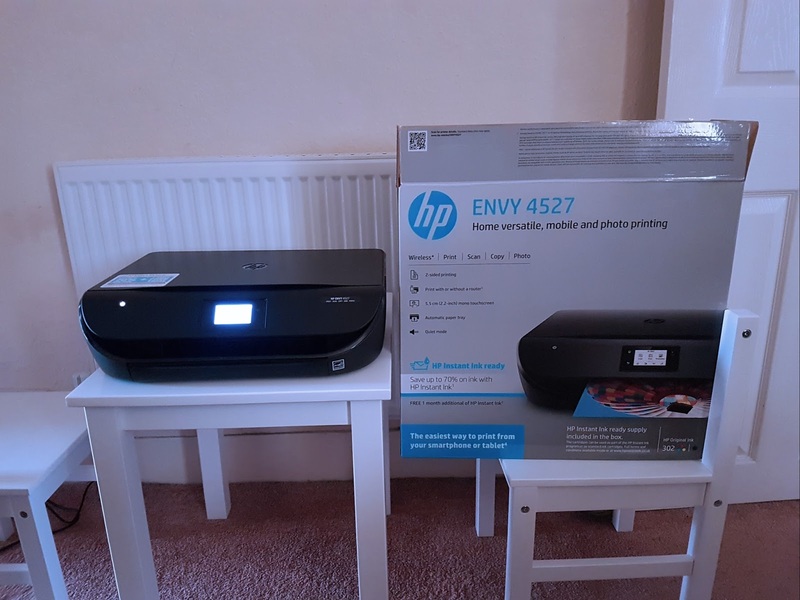 HP ENVY 4527 currently retails at £44.99 and I have to say for that price the printer is an absolute bargain. With its set up so easy and straightforward , it is surprisingly packed with such powerful and versatile features and capable of meeting your various printing needs. If you are someone who does a lot of remote working or working from home, you would probably find this ideal for your day to day routine and I find it functional enough to suit the needs of a very small office too. The printer definitely works a treat and cannot fault it. I would give it 🌟🌟🌟🌟 stars. Please note views and opinion expressed are solely mine. Hi there! Great review but can you give any indication of how long the ink lasts for and how much it is? This is a major consideration for me. My current printer is forever running out of ink (although I don't print much) and the cartridges cost a small fortune (more than a new printer for a whole set)! Thanks for stopping by Vicki. The printer itself retails for £44.99 and is also instant ink ready. 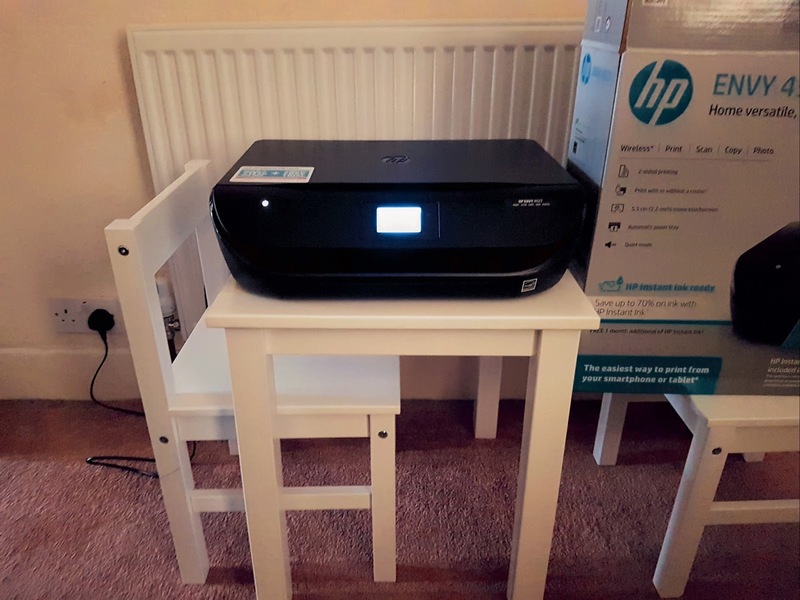 Its quite an economical printer as there is the regular ink replacement feature for a small monthly fee if you sign up to the HP instant ink service. That way you don't need to worry about running out of ink again, the printer automatically orders the ink itself via WIFI once it starts running low on ink. I forgot to also say the duration of the ink will depend on how much of printing you do too. As you say,you don't print much so I imagine you should be able to go a couple of months before having to think of ordering ink. Which is why I think the HP instant ink service is a great idea as you never have to worrying about running out of ink again. The printer takes care of that as long as its connected to WIFI ( As it needs to order the ink directly from HP). Please let me know what you think. Your views are very much welcome. Mummy Blogger with interest in all things review related. Looking to reach a wider audience? Get in touch.